It turned out that the island of Bonaire, relatively just a spitting distance from the northern coast of South America, is not quite the Hawaii of the Caribbean as I had heard. The Dominican Republic was definitely more tropical, in the sense that it was lusher. 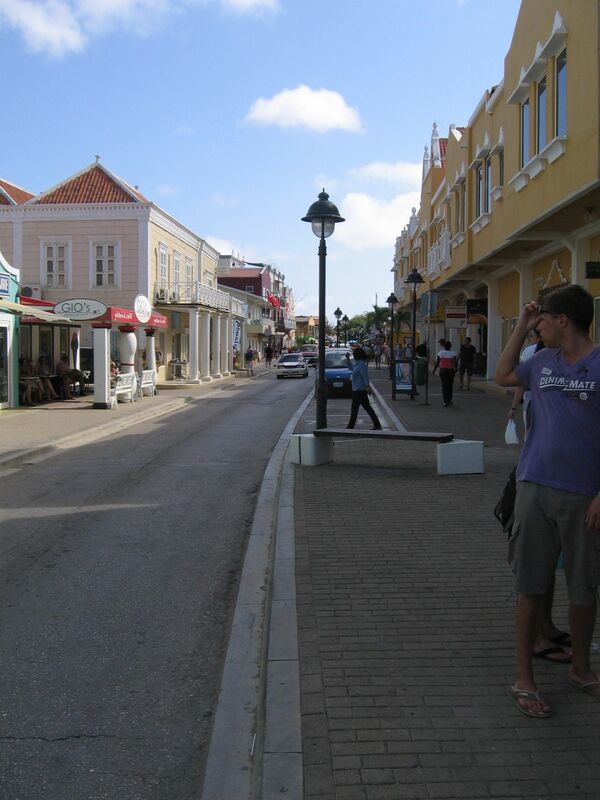 At least in this way Bonaire is more like Hawaii: it is more prosperous. This is probably due to it being settled by the Dutch instead of the Spaniards. The official language is Dutch, the unofficial language is English and is what most people speak and what most of the signs are in. Dollars are what are in the cash registers and listed as prices, at least among the tourist areas of the city next to the cruise port, Kralendijk. You can find modest traffic jams in Kralendijk, a factor of a surplus of yield and stop signs and a lack of traffic lights, but also due to a shortage of four lane roads. It’s just at thirteen degrees or so of northern latitude. I checked on an atlas on the cruise ship and Bonaire happens to be the furthest south I have ever been, beating out even a trip to Manila in 1987. At least its port city Kralendijk (really more of a neighborhood) did not come with yet another Margaritaville. In fact, I heard no Jimmy Buffet music whatsoever from shops along the tourist district. This suggested a Caribbean island with some class. There are a few chain stores on this island like a KFC, but most of the businesses seem to be one of a kind. Its small downtown strip is mostly anchored around Kava Carlos A. Nicollas Street, and includes a modest number of restaurants and boutiques. The sun rides high in the sky here, even in winter, so for us pasty white Americans it meant putting on a heavy coat of sunscreen. (We did cackle a bit learning that the temperature at home hit seventeen today and there were three inches of new snow on the ground.) Geography keeps hurricanes and a lot of rain from falling in this part of the south Caribbean. Which means that the island is at least as brown as green and tropical trees are relatively few with scrub bushes more prevalent. There are no mountains on Bonaire, but there is a hill on the north side of the island that look mountain-like due to its jagged features and lack of deciduous vegetation. The island itself is about eighteen miles long, shaped like a boomerang, and about three miles wide on average. You would expect that such a relatively flat island would be surrounded by shallow seas, but that is not the case. The beaches quickly deepen as evidenced by the densely blue seas close to shore. Getting out of the surf, as we discovered, is a bit of a challenge unless you ascend on a relatively modestly sloped spit of beach. You must also be careful when snorkeling to avoid touching the coral reefs, unless you want lacerated skin. So Bonaire is not Hawaii, but it is quite pretty. Perhaps due to its distance from the continental United States, it seems amazingly clean and natural. Its waters are crystal clear, aquamarine in the shallower areas and deep blue elsewhere. For divers, Bonaire is something of a paradise with many healthy coral reefs to explore, mostly on the leeward side of the island. If you like proximity to the ocean, it has much to offer. 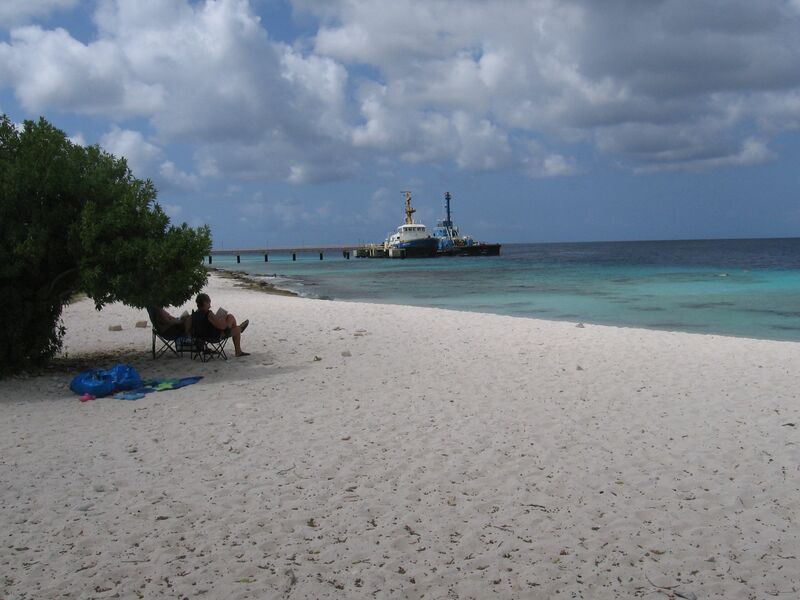 Is there industry in Bonaire? If there was much beyond the tourist business it was not obvious. Offshore banking is a big feature of many Caribbean islands. It would not surprise me if there were a few on this island too, such as we found on Grand Turk. Overall the economy is good, as evidenced by its first world standards. But overall its population is modest. We were one of two cruise ships in port. By hosting us, we had temporarily doubled the island’s population. The only other industry I noted was its salt works on the south side of the island. Grand Turk had salt works as well but it wasn’t profitable enough to remain in business, and closed in 1967. Not so in Bonaire. 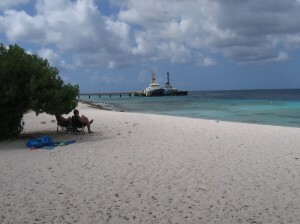 Those looking for a first world place in the Caribbean to retire to should consider Bonaire. We saw houses under construction near the airport, many with private docks for owner’s boats. Given the island’s absence of hurricanes, its tropical and generally dry climate, and the prevalence of English on the island, it would make a compelling retirement destination for many Americans who want some of the benefits of Hawaii without the long flying times and higher prices.